A paradise for flora and fauna, this tour is a must for nature lovers. Drive along the coast admiring mango and coconut plantations and learn about the lifestyle of the locals. 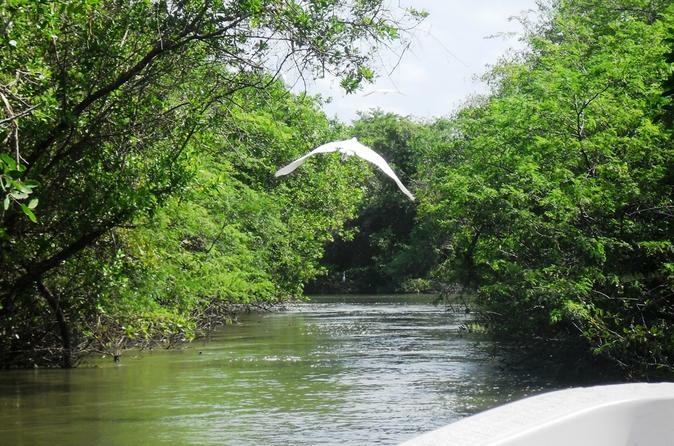 Upon arriving at Tres Palos Lagoon, you will board a private, typical motorboat to begin a breathtaking exploration of the lagoon where many exotic species of tropical birds call this sanctuary their home. See mangrove tunnels, a natural floating garden of wild flower and much more. Your tour leaves right from the lobby of your hotel where your friendly, fun loving and knowledgeable tour guide will pick you up with a sign "with your name". The tour heads south along the coast in route to Tres Palos Lagoon, approximately 45 minutes from your hotel. On arrival at the lagoon, you will board a typical motorboat for a cruise of no less than one hour through the lagoon. This sanctuary is home to many species of exotic birds. You will see mangrove tunnels, virgin lagoons and a natural garden of wild flowers during the cruise. This is a rare opportunity to explore this type of tropical nature preserve. Begin your tour admiring the mango trees, the coconut and palm groves as well as the delicate water hyacinths floating along the shores. There is a bird sanctuary that is home to gray and white herons, pelicans, marabous, storks and more. After the lagoon ride you will go for lunch where you will savor the internationally renowned "Pescado a la Talla", Charcoal Chicken or Mexican Cuisine, (the pescado a la talla has become a must for the Mexican tourist that visit Acapulco). After lunch you can walk along the lagoon side or going to the ocean beach which is within a walking distance.